Bitcoin, the world’s most popular cryptocurrency, has set another all-time high. The developers decided to abandon the idea of Segwit2x protocol. The news pushed the BTC exchange rate all the way up to $7848, Market Leader reports. According to CoinDesk, $7848 is a new all-time high for the digital currency. It should be noted that before the news about the Segwit2x protocol, Bitcoin was trading around $7700. Shortly after the news, the BTC exchange rate broke through the $7800 threshold. Later on, the price retraced to $7336, NordFX analysts report. If they had approved the implementation of the Segwit2x protocol, we would probably see another split (like the one with Bitcoin Cash) in the near future. However, the head of the Segwit2x project announced the decision to cancel this idea on November 8th. He said that the team had failed to compromise on the way of implementing the protocol, which might raise some problems for the cryptocurrency further down the road. The previous price record was set on November 2nd. Back then, the BTC exchange rate exceeded $7000 amid the news about a possible launch of Bitcoin futures. More and more experts are now predicting a further price rally for Bitcoin and other digital currencies. At the same time, Goldman Sachs has sent their clients a newsletter containing the bank’s Bitcoin forecast. In particular, the bank experts assume that Bitcoin is going to reach $7941 in the near future. 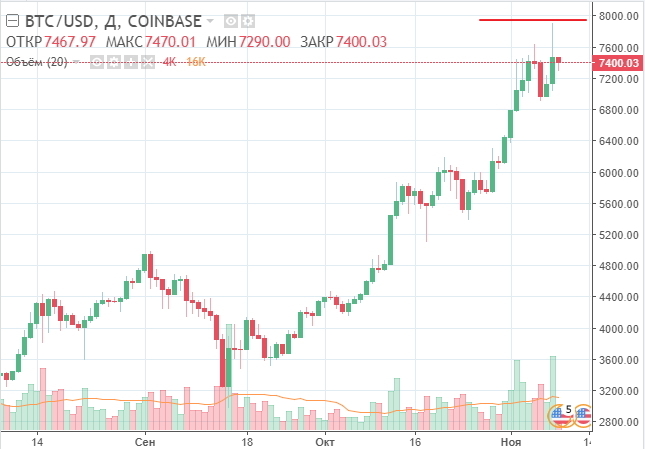 They say that now that the exchange rate has consolidated above $7600 and the bias is still bullish, Bitcoin has all chances to aim for another all-time high. However, the experts warn that Bitcoin may take some time to get ready for another rally the new highs. So far, Goldman Sachs analysts have been good at predicting Bitcoin’s behavior. At this point, Bitcoin’s market cap is over $120 billion.